The Apple Century Bike Ride is fully supported recreational ride with water/food stations and sag wagons. We will start in Wenatchee at Pybus Public Market, then follow along the scenic Wenatchee River as it winds through Monitor, Cashmere, Dryden and Peshastin until you reach Leavenworth. The 100-milers will continue on, to the Lake Wenatchee Fire Staton where they will turn around for the trip back to Pybus Public Market. Scenery includes high sage desert, lush orchards and vineyards, cool and clear river valleys, and tall ponderosa pine forests. On-site registration and pre-registration ride packet pick-up will be available on Friday afternoon, June 1st at Cycle Central in Downtown Wenatchee, and Saturday, June 2nd prior to the start at Pybus Public Market. 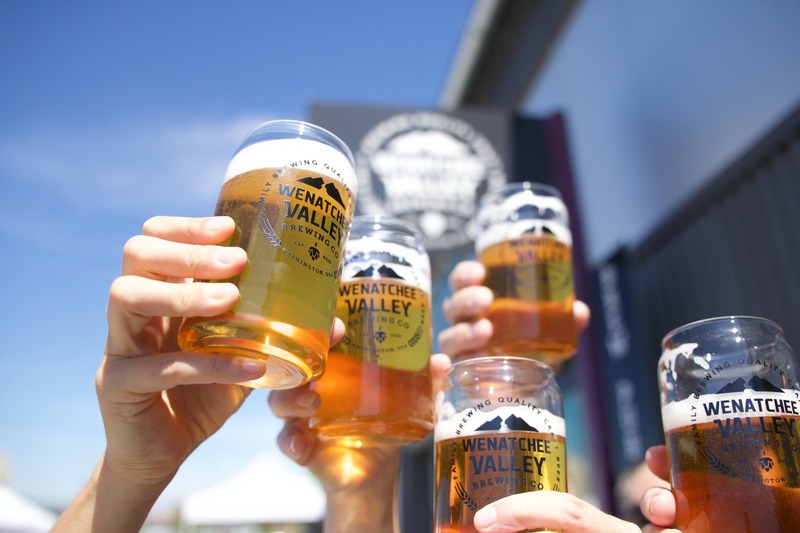 Pre-registered riders will recieve a commemorative pint glass from Wenatchee Valley Brewing Company featuring our ACBR logo, as well as have the opportunity to purchase a custom ride jersey. Online jersey sales have closed, however, you can still purchase jerseys on the day of the ride. Cost will be $75. Sizing will be unisex, and while we will have a limited quantity on hand for purchase and immediate pickup, any orders beyond that inventory will be shipped to the purchaser. Fees: $75 ea. through 11:59 PM PST 5/27/18 & $80 ea. thereafter via localraces.com. $85 Day-of. Finish Line Festival: Enjoy a free relaxing meal at the Finish Line Fest with music and a no-host beer garden. Food will be available from 11am-4pm. The beer garden will open at 11am and stay open later as there is interest. More details to come. Packet Pickup and Late Registration: Packet pickup and late registration will take place on June 1st from 5 p.m.-8 p.m. at Cycle Central, 34 N. Wenatchee Ave., or on the morning of the ride beginning at 6 a.m. at Pybus Public Market in Wenatchee (the starting point for the ride). 2018-Jersey Availability: Custom ACBR jerseys from Code Performance Wear is available for pre-order during the registration process for a cost of $65. Men's and women's sizes are available through April 25th. They will be available to pick up at packet pickup. Jersey orders placed after 4/25 will only be available in unisex sizing adn the cost goes up to $75. 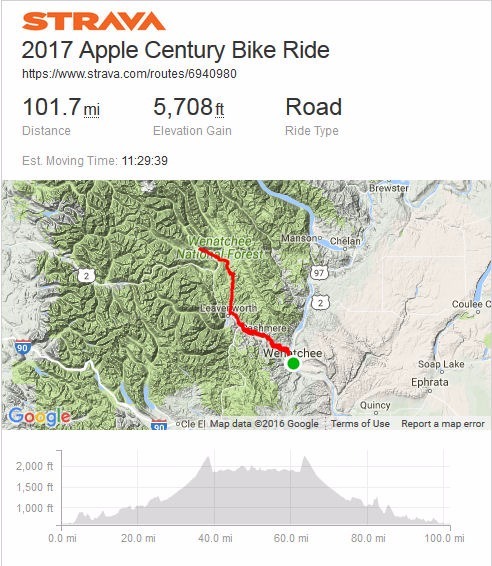 Updates will be posted here and at our Facebook page, https://www.facebook.com/applecenturybikeride. Ride Day Start Times: We will have staggered official starting times this year (with a pistol start even). 100 mile riders will start at 7am. 50 mile route starts at 7:30am. and the 25 mile ride will begin at 8am. Riders may leave earlier but pit stop and ride support may not be available. Route Updates: For 2018 the upper end of the 100 mile route will again utilize the Chiwawa Loop Rd out of Plain. Of course, last minute construction project may effect the route, but updates will be posted here as well as our facebook page. Sunrise Rotary Club & Apple Century Bike Ride The Wenatchee Sunrise Rotary Club motto is "Service Above Self". We believe that volunteering and providing humanitarian services is the best way to build goodwill and peace locally and globally. 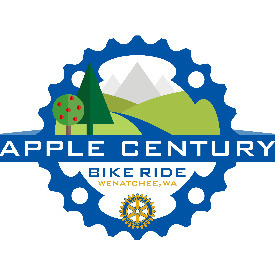 We organize the Apple Century Bike Ride each year as a way for people to enjoy the Wenatchee Valley's rich, beautiful landscape. And in return, your registration fees help fund scholarships, hunger & disaster relief, Polio eradication, international student exchange programs and dozens of community projects.